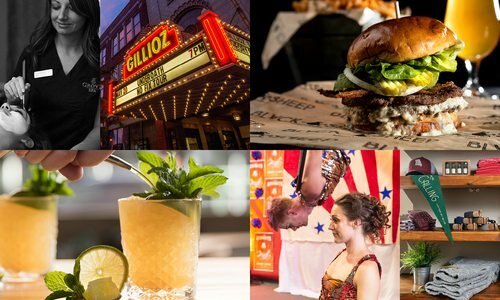 Smack dab in the middle of fancy California–style flavors and floppy, sloppy East Coast slices, southwest Missouri is filled with a hodge podge of pizzerias serving up a little bit of everything. In addition to 417-landers who are hand-crafting fresh artisanal pies with locally grown ingredients, restaurant owners came here from as far as Italy, as close as St. Louis and everywhere in between, and they brought along age-old recipes for foldable New York–style crusts, robust Chicago-style sauces and dozens of secret spice combos and cheese blends. But it doesn’t stop there. We’ve also recently gained a food truck that serves up wood-fired pies, plus a few spots where you can order pizza by the slice. 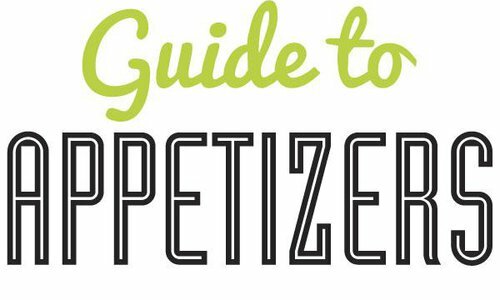 Read on to learn about all the pizzerias and restaurants that create southwest Missouri’s very own perfectly seasoned pizza scene. Pies at Bruno’s start with freshly made sauce and dough that’s stretched just thin enough to create a perfect crispy crust when baked in the restaurant’s brick oven. Toppings are carefully distributed, having just enough presence to add a zip of flavor. Favorites include L’Affumicata with smoked mozzarella, smoked bacon, smoked chicken and mushrooms; and Alla Salsiccia E Pepperoni with mozzarella, homemade Sicilian sausage, pepperoni, onions, red peppers and chili oil (mmm, spicy). Although he doesn’t classify his pizza as any particular style, Sicily native and restaurant owner Bruno Gargiulo says it’s a hit. “People come from places like New York and Chicago, where pizza is supposed to be excellent according to American tastes, and say it’s some of the best pizza they’ve ever had,” he says. The crust at Mama’s Style Kitchen is possibly the thinnest New York–style crust we’ve ever tried, and that’s a good thing. Originally from Pennsylvania, owner Tina DeLong longed to serve up pies like the ones back home, and when she purchased this restaurant two years ago, it had the perfect recipe on file. Slices here come wide and flavorful, and the super-thin dough makes them go down rather quickly. Every pie is made with fresh dough, mozzarella and provolone and a well-seasoned sauce that’s carefully constructed within DeLong’s specifications: It can’t be too sweet or too tomatoey. The restaurant also serves another East Coast favorite: white pizza with a sauce of olive oil, garlic and oregano. Don’t miss the plethora of specialty pies including the Chicken Bruschetta, and come on a Saturday for the Eggs Benedict breakfast pizza. The two McSalty’s Pizza locations have different owners, but the menus are the same. We love the thin wheat crust and homemade sauce loaded with a plethora of herbs and seasonings. The specialty Fools Gold pie comes topped with a sea of mozzarella, cheddar and provolone that’ll make your mouth water before you even take a bite. Arris’ Pizza serves pretty pizzas, arriving at your table with an adorably crimped crust that’s almost (keyword: almost) too beautiful to eat. The whole-wheat flour dough is made fresh at least twice daily and rolled out fairly thin before it’s topped and baked in an old stone oven. The sauce is also made fresh and flavored with garlic, basil, oregano and other signature spices. When it comes to toppings, Arris’ does two things extra-fabulously: the ground beef and the Greek sausage. “We get the meat fresh and put our own spices in it,” says Tani Kremer, who owns the restaurant with her husband, Joe, and her brother, Gary Whorton. One of the best ways to get a taste of that Greek sausage is on the Pandora specialty pie, where it’s served with black olives, bleu cheese, Roma tomatoes and pepperoni. Truly located in a cellar, this restaurant provides a cave-like atmosphere to enjoy while eating your pie. It offers regular and thin crust pizzas, both topped with homemade sauce and mozzarella that’s grated from 20-pound blocks. “If you like everything, try the special,” recommends Sandy Stoddard, who’s been a manager at the restaurant for 15 years. The special comes with pepperoni, Italian sausage, onions, black olives and green peppers. The hand-tossed original crust here is described as “not too thick or too thin” by Gary Morris. Morris owns the restaurant with his wife, Sally, and they run it with the help of their daughter, Meredith, who is the general manager. The pizza sauce is made daily with fresh tomatoes and a super-secret set of spices. “There’s a spice house in St. Louis that blends our spices for us, and they’re the only ones who know the ingredients,” Morris says. 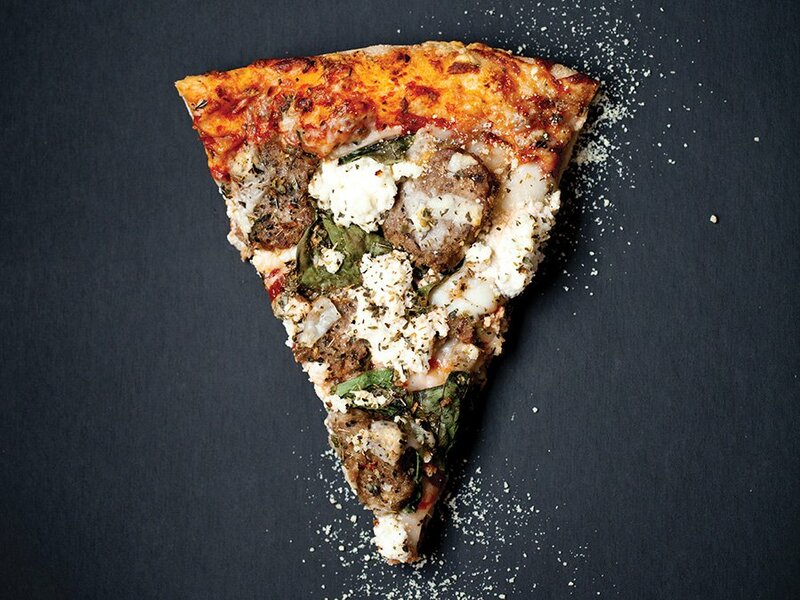 Pizzas can come fully loaded, like the Chef’s Supreme that packs on 12 toppings and weighs nearly 3-and-a-half pounds. Others are a bit simpler, like the Hawaiian topped with Canadian bacon, pineapple and Mandarin oranges. There’s also a Florentine pie with garlic-infused olive oil, mozzarella cheese, mushrooms, tomatoes and spinach artichoke dip as sauce (yes, dip as sauce). Be sure to save some room for the streusel dessert pizza. The Chicken Alfredo pizza from Mr. Biggs. In June 2010, Jason Bebout started serving piping-hot pizzas inside a charming old house (yes, we said house) in Republic. Soon, pizza-lovers started piling into the residence-turned-restaurant to order up pies, and Bebout opened a second location in Springfield nearly two years later. Both locations offer two kinds of pizza: a thin, flaky St. Louis–style pie that’s topped with a gooey provel blend and a gargantuan (18-inch!) hand-tossed New York–style pie that features mozzarella and freshly made dough. You’ll find anchovies and shrimp on the well-rounded toppings menu. 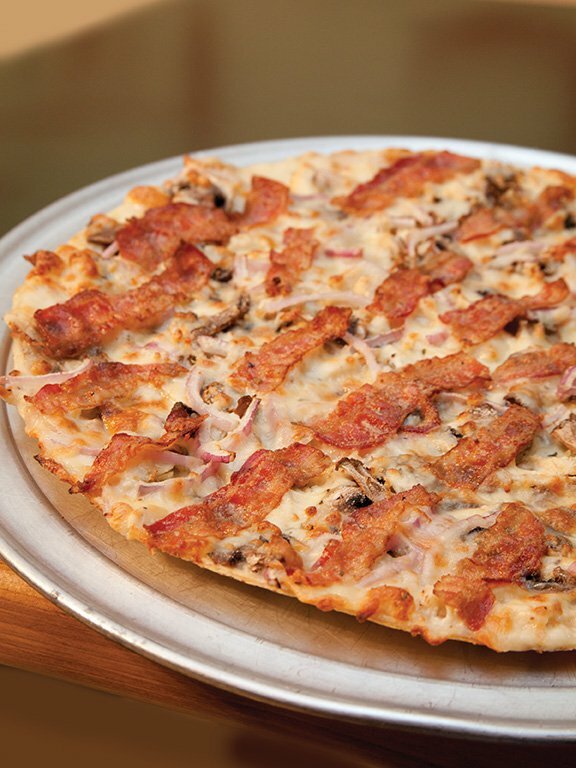 Try This Pie: The Chicken Alfredo pizza that’s topped with a thick and creamy Alfredo sauce, juicy chicken, crisp bacon, mushrooms and onion. You don’t have to go to a pizzeria to get a good slice—these local restaurants serve up some seriously delicious pies. These crispy thin-crust pies come with your choice of barbecue or pizza sauce, and you can choose from a fun list of toppings that includes pickles, bleu cheese, wasabi and sautéed onions and peppers for an additional charge. Chef Nicola Gilardi's slightly spicy tomato cream sauce replaces traditional red sauce on this pie, then it's topped with Italian sausage and mushrooms. This creation is topped with creole sauce, Anaheim peppers, chives, andouille sausage, chicken, pepperjack cheese and local mozzarella cheese. This pizza is made with bacon and goat cheese crust that's topped with fresh basil, mozzarella and grilled chicken then finished in the oven with gooey provel cheese. More complex than most buffalo chicken pies, this pizza features a garlic cream sauce, cheese, grilled buffalo chicken, bleu cheese crumbles and pico de gallo. The Classic Cheese from The Big Slice. Slices at this New York–style pizzeria are so big that they take up an entire dinner plate. Scratch that—they hang off of a dinner plate. “We offer a 12-inch and an 18-inch, but the 18 usually gets closer to 20 inches,” says Nathan Doran, who co-owns the restaurant with Levi Grant. Equally present are big flavors, as every pie boasts a robust, simple-yet-effective sauce made of tomatoes and a few spices. Many of the toppings are equally large (you’ve gotta check out the size of the pepperoni), and you’ll find a couple of exotic options, including a Jamaican jerk spicy sausage. In addition to whole pies, pizza is offered by the massive slice daily. Roll it, fold it, lift it, bite it! If you’re not in the mood for thin crust, try the Sicilian-style pie that’s made with an extra pound of dough and baked twice—once with just dough and sauce and again with another layer of sauce, cheese and toppings. And in case you have special dietary restrictions, know this: The Big Slice also offers 9-inch gluten-free pizzas. Try This Pie: The Classic Cheese “This is probably our signature pie because plain cheese is Levi’s thing–we use the best cheese you can buy,” says Nathan Doran, co-owner of The Big Slice. The Breakfast Pizza at Firelight Pizza Company. On Saturday mornings, this food truck serves freshly made pies at Farmers Market of the Ozarks, 4139 S. Nature Center Way, Springfield. Contact the truck at 417-848-4541. Firelight Pizza Company owner Jason Brock gets to the Farmers Market of the Ozarks extra early every Saturday morning to shop for toppings for his artisanal pizzas. “A lot of times, our toppings for the day depend on what’s in season,” Brock says. After purchasing the fresh goods, Brock gets to work crafting pies in his mobile food truck that’s fully equipped with a wood-fired pizza oven from Italy. Among the most popular pies here are the breakfast pizzas and the pizza topped with Willow Mountain mushrooms. All the pies come with a perfectly crisp-yet-chewy wood-fired crust. Try This Pie: The Breakfast Pizza at Firelight Pizza Company, the breakfast pizza comes with mozzarella, market-fresh goat cheese and herbs and a farm-fresh egg. Pizza House owner's favorite creation, which is a pie topped with hamburger, mushroom and fresh tomato. Pizza House has been serving up the same style of thin crust, square-cut pizza since it opened in 1958. “We keep with what’s always worked,” says current owner Stacey Schneider, who has worked at the restaurant since she was 15. “What’s always worked” includes a very limited menu of pizza, salad and soda. This strategy allows the more than dozen employees to devote all of their focus to making fresh dough, stirring up fresh sauce and even grinding fresh mozzarella cheese from 40-pound blocks. And Schneider even cooks many of her regular customers’ pizzas to order. “I know the little things, like who likes their crust a little darker around the edges,” she says. While the recipes are all the same as they were more than 50 years ago, one thing has changed—Pizza House recently started taking credit cards. The signature crust at PaPPo’s Pizzeria, owned by Briana Mathews and Jonathan Swisher, can best be described as hand-tossed. Just like the dough, the sauce here is made fresh every day with plump Roma tomatoes, fresh basil and a handful of secret ingredients. The restaurant has several not-so-typical topping options, including slow-cooked roasted pork, Genoa salami, capicola, sliced family-recipe meatballs and feta, fontina, gorgonzola and Swiss cheeses. And its specialty pizza list is long and impressive, including a steak pizza with homemade pesto, sirloin, fresh mushrooms, red onions and gorgonzola, Parmesan, Romano and asiago cheeses! There’s also a breakfast pizza here, and cheese, sausage and pepperoni pies are sold by the slice from 11:30 p.m. to 2 a.m. on Thursday, Friday and Saturday. Try This Pie: Add ricotta cheese to the meatball pizza, which comes with sliced meatballs, red sauce, mozzarella, Parmesan and fresh basil. The world of pizza is far more complex than crust, sauce and cheese. Read up on the pizza styles you can find at 417-land pizzerias. Never looking exactly the same, these pies are delicately crafted with hand-tossed dough and topped with fresh, seasonal ingredients and fresh mozzarella, which is sometimes accompanied by non-traditional cheeses (such as feta, goat cheese or bleu cheese). They’re often personal size and sliced into small wedges. Sliced into wedges, these are thin-crust pies that are often topped with mozzarella and non-traditional cheeses and specialty sauces. Toppings come in traditional and non-traditional varieties (including barbecue chicken and Thai chicken), and pies are often wood-fired. A deep-dish pie that’s most often topped with mozzarella and Parmigiano-Reggiano cheeses, this pizza features a chunkier sweet or savory sauce that often comes on top of the pie. Toppings are usually sliced large, and the pie is sliced in wedges and baked in a deck oven. Made on a thin and firm crust that’s slightly crunchy, this less-well-known Chicago-style pie features mozzarella and Parmigiano-Reggiano, savory or spicy sauce and large toppings. Pies are baked in a deck oven and tavern cut, which means they’re sliced in small rectangles, squares and wedges. Thin, hand-tossed dough forms a base for these large pies, which come with wide and foldable slices. The pizzas are often topped with mozzarella and sweet or savory sauce and served “plain” (topped with only cheese) or with traditional toppings, and they’re baked in wood, coal or deck ovens. This pie is often rectangular in shape and made with a super-thick crust that’s chewy in the center and slightly crunchy on the outside. It features mozzarella cheese, sweet or savory sauce and traditional toppings, and it’s cut in squares and baked in a deck oven. St. Louis–style pizzas feature thin, cracker-like crunchy crust, provel cheese (a mix of provolone, Swiss and white cheddar) and sweet or savory sauce. Toppings are often large pieces of vegetables and meat, and the pizzas are baked in a deck oven and tavern-cut in small rectangles or squares. I’ve lived in southwest Missouri for most of my life, but I spent my first eight years (and many, many summers) on the East Coast. This fact is really only relevant when it comes to two things: cheesesteak sandwiches and pizza. To me, there’s only one right way to order a cheesesteak, and foldable, giant slices of New York-style pizza are the absolute best. 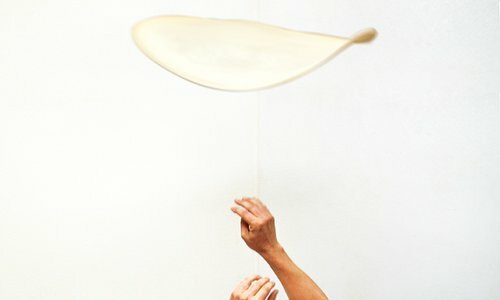 Since this story is about all things pizza, we decided that I should get a little first-hand experience with throwing dough. Jason Bappe, who recently opened Jax and Gabe’s Pizzeria and has been making New York–style pies for 20 years, kindly allowed us in his restaurant’s kitchen to give it a shot. Read the tips I learned during my dough-tossing training, and give Bappe’s recipe a shot. You’ll be enjoying a big ol’ slice of New York–style pie in no time. Use high-gluten flour. To create a New York–style pizza, you need a very elastic dough. High-gluten flour provides the elasticity needed to stretch and throw the dough. If you use regular flour, it will rip or tear much easier. Be generous with the flour. Sprinkle plenty of flour on your work surface, and coat your hands with flour as well. Flip the dough in flour to cover both sides, and even roll the perimeter of the dough ball in flour. This will help prevent the dough from sticking to your hands and make it less likely to rip or tear. Be confident. One of my biggest mistakes when throwing the dough was not believing in myself. Don’t be afraid to toss the dough in the air—the worst thing that can happen is it can land on the floor, and then you can just start over. You can do this! Bake it good. While you can use any pizza pan to bake your pie, Bappe suggests baking it on a pizza stone. When using an at-home oven, this is the best way to get a crispier crust. 1. Mix water, yeast and sugar until yeast is dissolved. 2. Pour mixture into a stand mixer bowl. 3. Add flour, salt and oil. 4. Attach dough hook to your mixer, and mix on low speed until the dough starts to form and climb the dough hook. 5. Remove dough from bowl, and form into a ball shape. 6. Coat a bowl with olive oil, and place dough ball in the coated bowl. Cover with a towel, and let rise for 45 minutes or until the ball almost doubles in size. 8. Place pizza stone in the oven, and preheat oven to 500°F. 9. Once stone is warm, place topped pizza on stone and bake pizza until crust is golden brown, approximately 8 to 10 minutes. 10. Remove from oven, and enjoy. 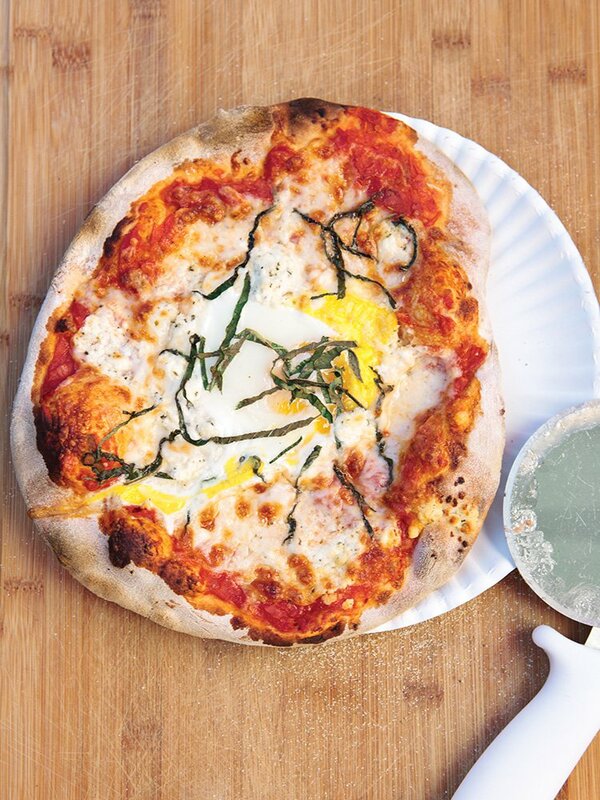 Want to create your own New York­-style pizza at home? Check out these step-by-step tips for throwing dough, and you’ll be enjoying a slice of pie in no time. 1. When you’re ready to prepare your pizza, cover the dough ball in more of the high-gluten flour. You’ll want it everywhere—I flipped the dough to cover both sides a few times, and I even rolled the perimeter of the dough in the flour to cover the sides. 2. Sprinkle your working surface with more of the high-gluten flour, and place your dough ball on the surface. Using your hands, form a short crust around the perimeter of the ball, and work the air bubbles out of the center. As you are working out the air bubbles, you will also begin to slightly stretch the dough. 3. 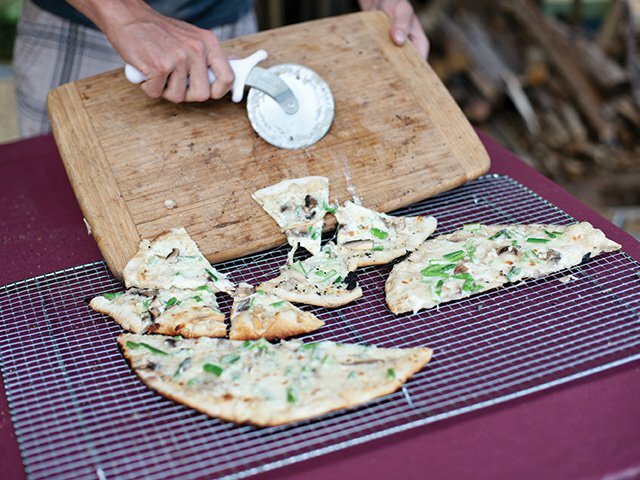 Once your air bubbles are gone and your crust is formed, carefully pick up the dough ball. Make a fist with one hand and place the dough over it, then make another fist and place your hands together under the dough. Slowly separate your hands to stretch the dough, turning the dough disc as you work. Repeat until the dough is TK inches in diameter. 4. Take your dominate hand, turn it upside down (so your palm is facing the dough) and rest the dough on your fingertips. Do the same with your opposite hand, and lightly toss the dough in the air with your dominate hand. 5. Softly catch the dough on the edge of your fingers, and move your hands apart to stretch it larger. (Note: The word softly is very important here—I threw my hand in the air too quickly, and my fat little Polish sausage finger broke a hole in the dough.) Moving quickly, continue this step until the dough is as large as you wish. 6. If you want to get fancy, make a fist, place the dough on top and move your arm clockwise, spinning the dough on one hand. 7. Once your pizza is to your desired size, top, bake and enjoy. 1. Combine flour, yeast, sugar, oil and salt in a large mixing bowl. 2. Mix thoroughly, then add water. 3. Mix with wooden spoon or by hand for three to four minutes or until a rough ball is formed. 4. Let the dough rest for a few minutes, and prepare a smooth floured surface. 5. Knead the dough by rolling and folding it on your floured surface. You may need to add a little more water or flour to make a firm, smooth dough ball. 10. Remove from oven and enjoy. The Falafel Pizza from Mohaska Farmhouse. (Editor's note: This restaurant has closed since the publication of this article.) A huge chunk of the menu at Mohaska Farmhouse, owned by Eric Dicharry and Jamey and Kristi Smith, is dedicated to inventive pizzas, which Dicharry says are made with as many local products as they can find. The dough is made fresh daily with organic flour, and the restaurant also has a gluten-free option. The artisanal pies are offered in 15 specialty varieties, including tasty creations like the Smoked Salmon made with white sauce, goat cheese, spinach, roasted pepper, shiitake mushrooms, cucumbers, herbs and the fish itself. 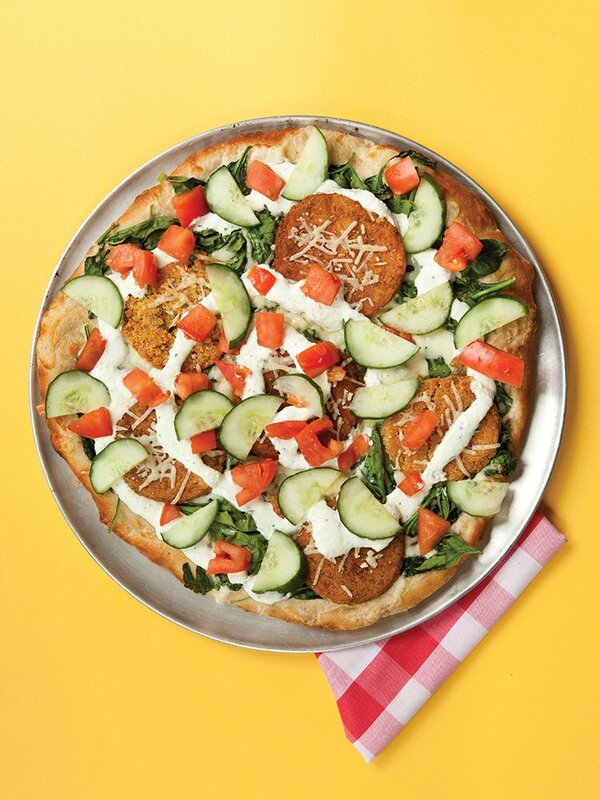 Try This Pie: The Falafel Pizza-Mohaska Farmhouse loads up this tasty pie with tzatziki, white cream sauce, fresh tomato, spinach, cucumber and house-made falafel. 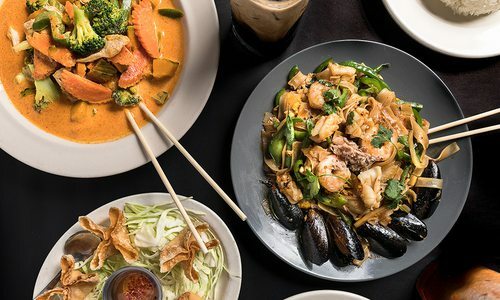 (Editor's note: This restaurant has merged with JBs Downtown since the publication of this article.) “Our sauce is both spicy and sweet with a lot of complexity,” says Rocco’s Palace Pizza owner Robert Rice. “It’s seasoned with 17 or 18 spices.” Every 16-inch pie is topped with this sauce, plus an entire pound of cheese, using a blend of mozzarella, provolone, smoked provolone and Parmesan. It’s sold via lovely wedge-shaped slices or by the whole pie. Also on the menu is a fresh fruit pizza topped with a yogurt-based sauce, provolone cheese, seasonal fruit and a special frosting. “We’ll have apples, nectarines, blueberries and maybe even pumpkin in November,” Rice says. A stone-hearth pizza oven sits front and center at Crossroads Pizza, inviting hungry Silver Dollar City visitors to watch their pies bake. Pizzas are made on a traditional thin crust of fresh dough, and the sauce is a hearty balance of vine-ripened tomatoes and basil. In addition to the delicious pie, the look and feel of the building make the restaurant a great place to grab a bite. Is there such a thing as good pizza served at a bowling alley? The answer is yes—if you’re at R.T.’s Family Restaurant in Kimberling City. When owner Randy Thamm took over, he put a lot of time and energy in the restaurant, making it as desirable a destination as the bowling alley already was. Staff at this pin-and-pie joint make fresh dough and use 100-percent whole milk mozzarella cheese, which Thamm says really sets them apart. The restaurant can even do take-and-bake. At Parmesan’s Reeds Spring location, the Spaghetti and Meatball pizza (wow!) and the Chicken Cordon Bleu pizza are two of many inventive pies on the menu. “We buy the freshest ingredients we can, and we even grow a lot of our own produce on the premises,” says owner Jacob Moschner. The restaurant also offers breakfast pizza on Sundays and a dessert pizza made with blueberry pie filling, vanilla pudding and streusel. The Mama Gilberti’s with black olives, mushrooms, marinated green peppers, red onions, tomatoes and spinach. Pies at Mr. Gilberti’s Place are built upside down. Yes, you read that right. First, a thin homemade dough is spread out in a deep-dish pan. Next, cheese and spices are sprinkled across the crust, a layer of toppings is tossed on and it’s all topped with a homemade sauce. “You need a knife and a fork to eat it,” says Susan Gilberti, who owns the restaurant with her husband, Wayne. 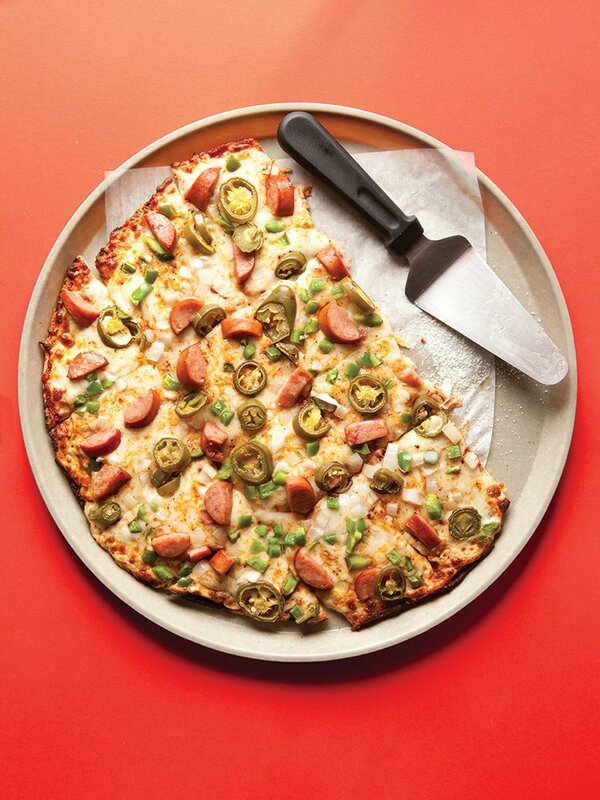 The restaurant also offers wheat- and thin-crust pizzas and a fun topping option of giardiniera peppers from Chicago. Try This Pie: The Mama Gilberti’s with black olives, mushrooms, marinated green peppers, red onions, tomatoes and spinach. We opted to keep the focus of this pizza feature super-local, so you won’t find corporate giants like Domino’s or Papa John’s. 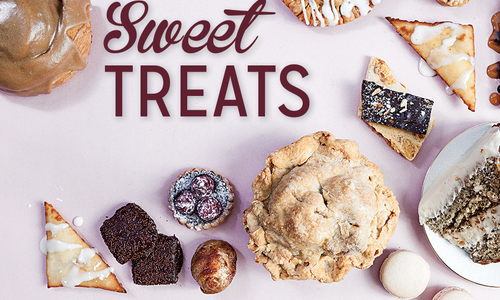 But these not-so-huge regional chains are a step above, and each is worth a try when you’re craving pie. Cut into cute little squares and topped with provel cheese that often sticks to the roof of your mouth, Imo's pies are the original St. Louis-style pizzas. Yum! (Editor's Note: Rosati's Pizza has closed since this article was first published) Pies here are nearly as deep as the Atlantic and are filled with a boatload of toppings and cheese. You must try the Double Deckeroni pizza here. The crust is garlicky and extra buttery, and the spicy pepperonis make your tastebuds rage. In addition to the beautifully glistening pizza bar here, the spot has kid-friendly entertainment that'll have your little one calling you the best ma in the world. Newk's serves tasty California-style pies. Try the Newk's Q with chili oil, white barbecue sauce, mozzarella, provolone, bacon, tomatoes and a jalapeño garnish. With a location in Joplin, this spot serves Chicago-style pies with the sauce on top, and the specialties have fun names like Moosehead and Grub's Choice. The Haight Ashbury at The Grotto. California–style pizzas at The Grotto are all made on fresh dough and feature hand-cut mozzarella, provolone, sea salt, cracked pepper and herbs. The sauce here is a spicier, fuller herb sauce that’s made with crushed red pepper and plenty of fresh garlic. “There’s some actual heat as far as spice goes, but we’ve toned it down a bit,” says owner Mark Coleman. In addition to red sauce, The Grotto makes all the sauces for its specialty pies, including a Thai peanut sauce for the Thai Chicken, the peach habanero sauce for the Carnitas Habanero and the Jamaican jerk sauce for the Calypso. “We offer all of those specialties in the summer months,” Coleman says. A favorite specialty on the menu all of the time is the Haight Ashbury. Try This Pie: The Haight Ashbury- The Grotto loads this pie with freshly made pesto, Roma tomatoes, portobellos, button mushrooms, caramelized onions, fresh garlic, fresh basil, bacon and Asiago cheese. “I think I know about every New York or New Jersey guy in this area,” says John Palazzolo, who owns the Rocco’s franchise and the Nixa restaurant. That’s because East Coast natives flock to Rocco’s to feed their cravings for authentic New York–style pizza, which Rocco’s creates daily from recipes Palazzolo’s dad used to serve at restaurants in New Jersey and North Carolina. 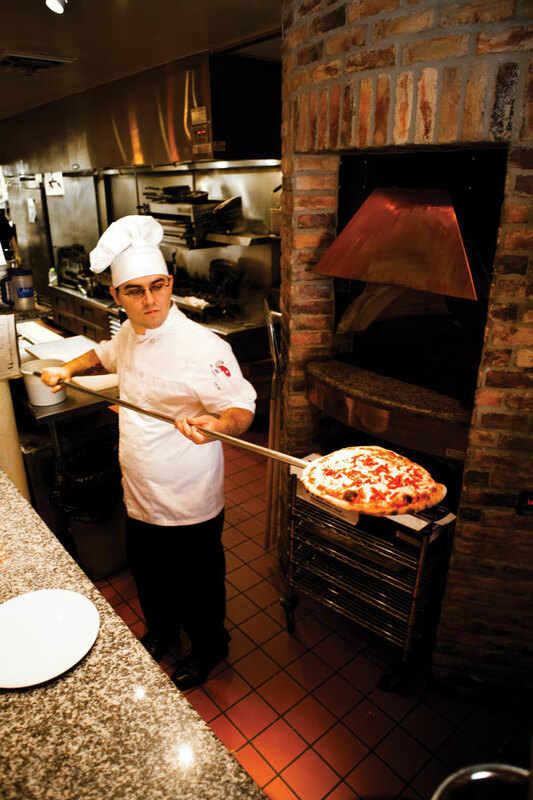 Palazzolo makes the dough and sauce each day for all of the Rocco’s locations, ensuring a consistent taste. This dough and sauce are later turned into a delicious pie, baked and sliced into giant triangles that are perfect for folding as you devour them. If you have a hankering for another East Coast favorite, try the spot’s Philly cheesesteaks. Try This Pie: The meat-lover’s with pepperoni, bacon, freshly sliced ham and freshly sliced sausage. Dough at Bongo’s Bistro is made differently than your traditional pizza dough: It has Italian seasonings blended inside. The pizza is available in thin crust, traditional or deep dish, and it’s always topped with the restaurant’s thicker-than-average sauce and tasty buffalo mozzarella. Signature pies at Bongo’s include the chicken Alfredo with homemade Alfredo sauce (chicken Alfredo is among the Italian eatery’s most popular dishes) and the Philly cheesesteak that’s made with steak, onions, green peppers and Swiss and mozzarella cheeses. Try This Pie: Owner Aubrey Foster’s favorite is The Judge pizza, which is topped with pepperoni, spinach, artichoke hearts, garlic and banana peppers. “I like it on a thin crust,” Foster says. Bud & Walt’s has been serving up Chicago-style pies since it opened in 2007, but it’s most likely not the Chicago–style you expect. 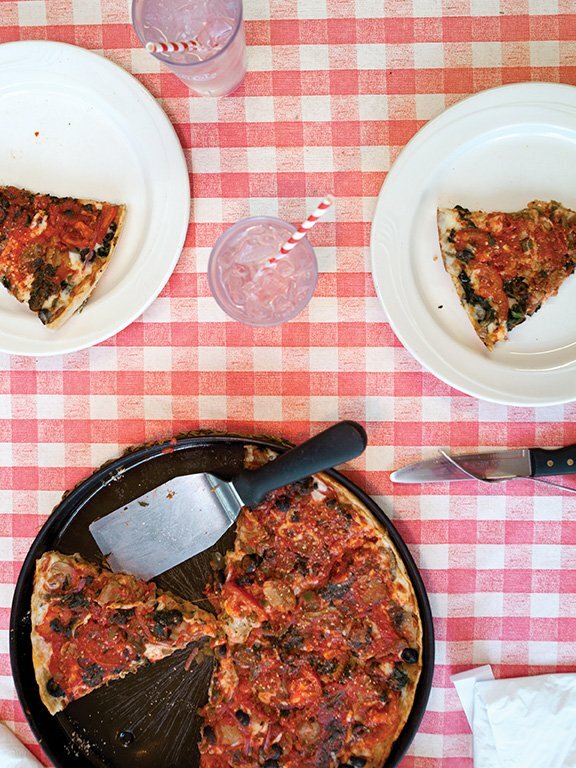 “Most people think of Chicago-style as deep dish, which it is, but before the deep dish there was a thin crust, especially in East Chicago,” says managing partner Leon Fisher. And this is what Bud & Walt’s specializes in. “It’s very different than St. Louis–style pizza, but it is square cut,” Fisher says. At Bud & Walt’s, homemade dough is topped with a lot of sauce that’s a little bit sweeter than most, and toppings go from edge to edge. Both the sausage and ground beef are made in-house and cooked on top of the pizza. The restaurant also has wheat crust and gluten-free crust, and half of all profits goes to mission work. Good pie and a good deed? We like it. Try This Pie: The Chi-town Bacon Cheeseburger with homemade sauce, freshly ground beef, onions, bacon and mozzarella and cheddar cheeses. A year and a half ago, Heather Herd decided to add a restaurant to Hollister’s dining scene, so she opened Hook & Ladder Pizza Company with her husband, Dave (a firefighter). Themed to promote the local fire department, Hook & Ladder serves up some seriously delicious pizza with freshly made dough and sauce, hand-cut veggies and other top-notch toppings. If red sauce isn’t your cup of tea, you can order pies with Alfredo. There’s even an Alfredo specialty pizza with chicken, onions, mushrooms and a special cheese blend. Try This Pie: If you like spice, try out the 3 Alarm pizza with the restaurant’s super-spicy 3 Alarm hot sauce, chicken, onions and jalepeños. Dough stretches far beyond the pizza pan. Local pizzerias serve up other tasty dough-centric goodies, too. Here are just a few. The same size as a pizza, orders of these cheesesticks are made with dough that’s covered with Italian seasoning, garlic salt, pomace oil and a couple of cheese blends (including mozzarella, buffalo mozzarella and provolone). They’re served with marinara or ranch dressing for dipping. Simplicity is delicious at D’Arpino’s. To create this mouthwatering bread, pepperoni and mozzarella are simply rolled up inside the fresh dough, then baked and served with marinara. To create these little masterpieces, fresh pieces of hand-tossed dough are brushed with garlic butter and a special blend of Italian seasonings. And if you’re a dipper, be glad—they’re served with marinara sauce. Perfect for enjoying after a slice of spicy pie, these treats are made with bits of homemade dough that have been tossed in butter and cinnamon sugar. Bonus: They’re served with homemade icing. In addition to being rolled into a pizza, dough at Bongo’s is formed into mini loaves of bread, brushed with olive oil, sprinkled with mozzarella, baked and served with Italian seasonings and more oil. Yummo! These made-from-scratch pockets feature fresh dough that’s stuffed full of mozzarella and pepperoni, brushed with garlic butter and oregano, baked and served with a side of marinara. Basically a folded pizza, this yummy creation features freshly made dough that’s filled with cheese, sauce and a load of mouthwatering toppings. Made with hand-tossed dough, calzones here are filled with mozzarella cheese and toppings and served with a side of meat sauce. Can't choose between pie or a calzone? Try one of each! Forget boring pepperoni—local pizza joints are serving up pies with some one-of-a-kind toppings you have to try. Pizza hot off of the fire at a Pizza Night at Millsap Farms. Millsap Farms, 6593 N. Emu Ln., Springfield, 417-839-0847, millsapfarms.com; to subscribe to the farm’s newsletter and be kept up-to-date on pizza nights, email farm owner Curtis Millsap at millsapfarms@gmail.com. On every Thursday night during the typical farmers’ market season (April through October), Millsap Farms invites you to try a pizza unlike any you’ve ever had before. The farm’s buffet-style pizza nights always feature several artisanal pies topped with whatever is being harvested that week. 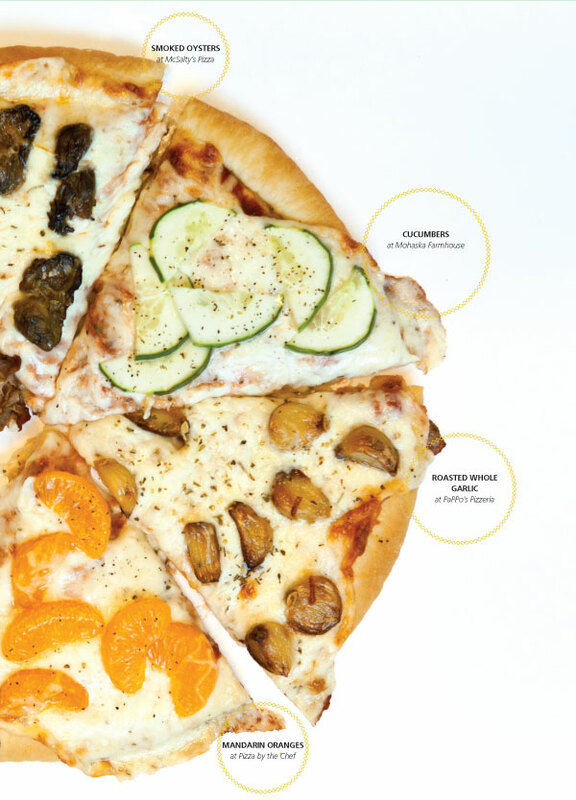 Earlier this year, the pizza spreads included drool-inducing topping combos such as bacon, kale and apple with bleu cheese, balsamic vinegar–caramelized squash and onion and even bacon, arugula and tomato with garlic aioli. Before you can enjoy a slice of pie, you have to pay $1 and become a member of the Pizza Club. You’ll find plenty of the usual specialty pizzas at Altenhof Inn, but it’s the more unusual options that have our mouths watering. “The Bavarian Highlight has bratwurst, knackwurst, sauerkraut and onions,” says Gertraude Santo, the restaurant owner who came here from Germany in 1966. The medium-crust pies come in 7 or 12 inches, and there’s also a 10-inch thin crust on the menu. Those watching their waistlines can try the Slimline with mushrooms, olives, green peppers and onions. No matter what pie you order, make sure to dine in­—the restaurant has a great balcony with amazing views of Table Rock Lake. But plan accordingly—as a seasonal business, it usually closes around the end of November and opens back up in mid-March. (Editor's note: This restaurant has closed since the publication of this article.) While all of the pizza crusts at Cravin’ Pizza are thin, the crust on the Owner’s Deluxe is what owner Jim Ashford calls a much thicker thin. “We have to make it thicker because it has so many toppings on it,” Ashford says. A behemoth in the pizza world, the pie is piled with cheese, sausage, Canadian bacon, pepperoni, freshly sliced mushrooms, onions and bell peppers, slices of breakfast bacon, sliced tomatoes, kalamata olives and green olives. Another signature pie is the avocado pizza with Canadian bacon, tomatoes and avocado. 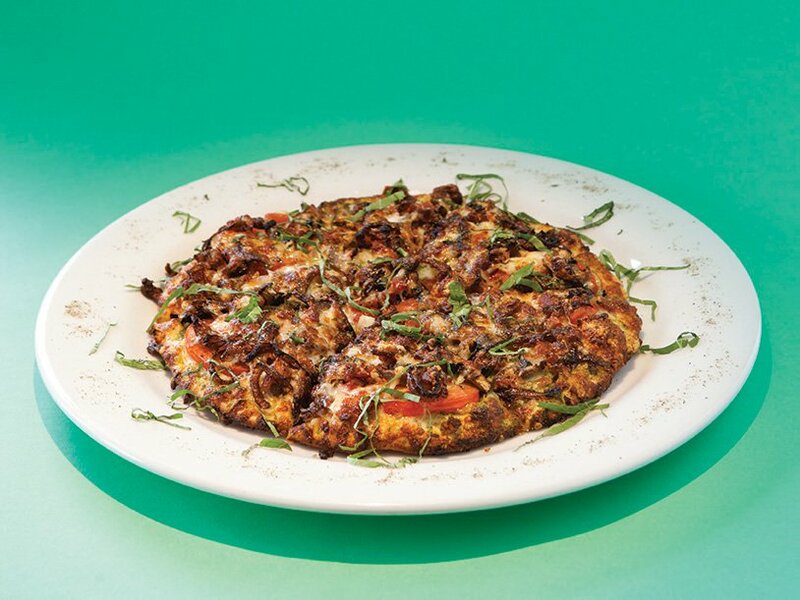 Garbo’s Pizzeria is best known for its thin St. Louis–style crust, its gooey, delicious provel and mozzarella cheese blend and its rather quirky topping combos. “Mom came up with all the recipes, and she’s quirky herself,” says Laine Scholz, who co-owns the restaurant with her mother Pam Babcock. Among the not-so-typical pies offered here is the Sauer Italian, topped with hamburger, green olives, mushrooms, Italian sausage, red onion, sauerkraut and Alfredo sauce. Before you indulge in a pie (also available with thicker crust, if you prefer), try Garbo’s house salad. It comes topped with a secret-recipe vinaigrette. Try This Pie: The spicy chicken pie with red onion, mushrooms, green peppers and Alfredo sauce. “It normally comes with red sauce, but it’s great with Alfredo because it offsets the spiciness,” Scholz says. Although it just opened last February, Jax and Gabe’s Pizzeria quickly became known for its signature New York–style pie. 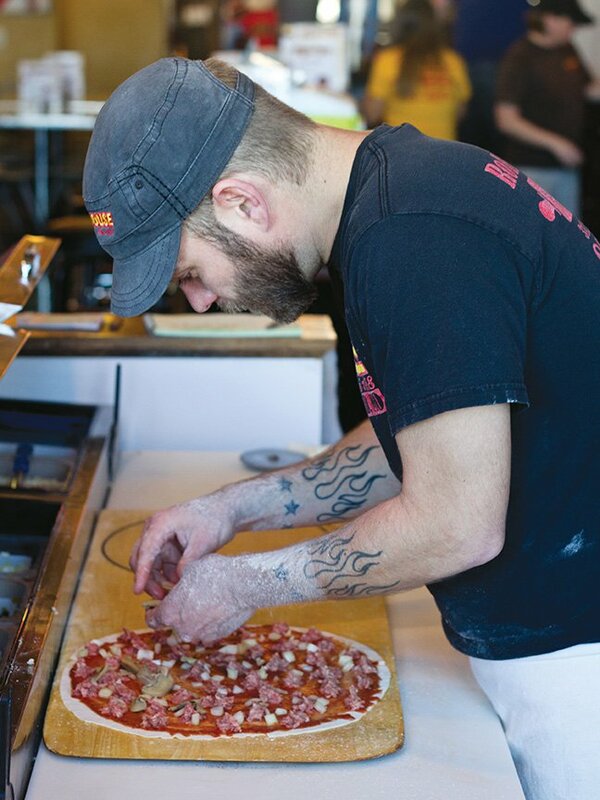 Workers at this south Springfield restaurant throw the dough high above their heads during prep to create that unrivaled thin crust that New York–style pizza is known for. And when you walk up to the counter, you’ll see a beautiful sight: a selection of pizzas sitting, ready to order by the large, foldable slice from 11 a.m. to 7 p.m. daily. Of course, whole pies are also available for feeding your family (or a very, very hungry you). Broccoli and crushed garlic add excitement to the toppings menu, and the restaurant’s garlic knots make the perfect side. The Big Easy at JJ's Woodfire Pizza. JJ Spurlin, a professor at Missouri Southern State University, opened JJ’s Woodfire Pizza in January 2012. The restaurant offers 9- and 14-inch pies topped with homemade sauce and baked in a wood-fired oven with a red oak and hickory blend. The creations are often topped with produce from the Webb City Farmers’ Market, and a great time to try a bite is during the pizza buffet offered Monday through Friday from 11 a.m. to 2 p.m. and Monday nights from 5:30 to 8:30 p.m. “We smoke our own brisket and our own pork loin for pizzas and put those out on the buffet,” Spurlin says. “It’s getting hard to even find a spot in here during that time.” JJ’s also serves a tasty dessert pizza—a streusel-cinnamon sugar concoction called the Pudgy Pie. 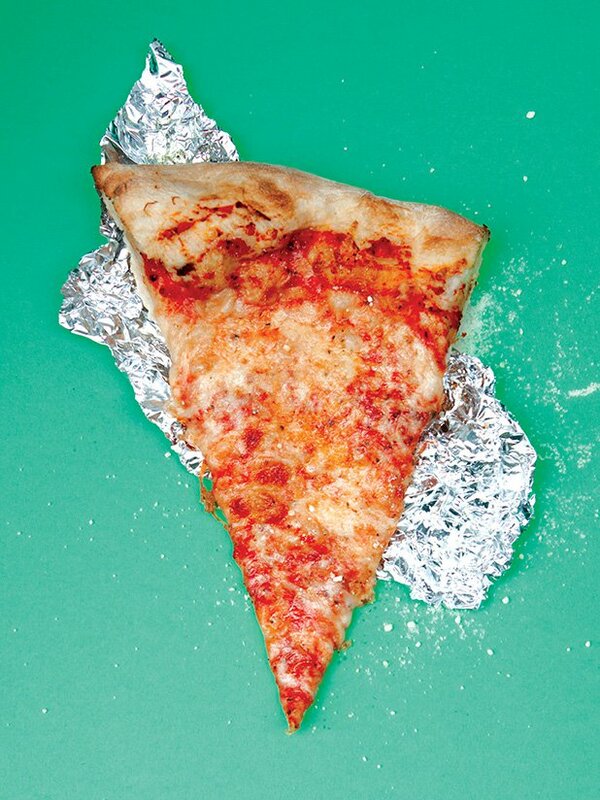 Prepare yourself for foldable, giant slices of New York-style pizza. Recipe courtesy Jason Bappe, owner of Jax and Gabe’s Pizzeria.